Though I have been known to have some breakfast issues, french toast and I have no issues at all. If I am making breakfast, it's likely that I am making french toast. 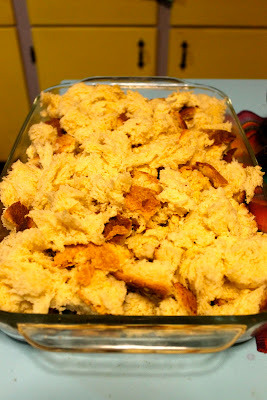 A few weeks ago, when I had a breakfast meeting, I decided to make a french toast casserole. Since then, I have been experimenting with making it my own. 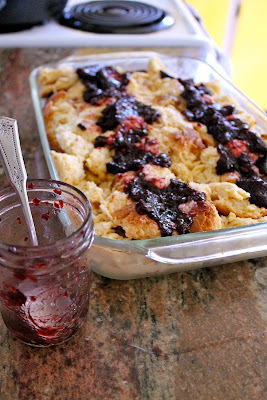 That was when I was struck with a brilliant idea: adding blueberry jam to the casserole! It tastes positively heavenly. There isn't a huge amount of sugar in this, surprisingly, and for the size of the casserole, it is fairly well behaved in the butter department. However, if you're eating this at all, chances are you aren't altogether worried about the calories. It takes just a bit of planning ahead because you need to let it it overnight, but that makes it perfect for the weekend or for a brunch that you are planning. Plus, it feeds a small crowd! Here I have a loaf of Challah bread. I made it myself, but it should be available in most bakeries if you don't have a bread machine. This is a two pound loaf, so if you are buying it, you will likely need to get two one pound loaves. Spray your pan with some Pam or grease it will some butter. Break it up the bread using your hands...which I call "rustic." In a bowl, mix together 10 eggs, 1 1/4 cups milk (I used almond milk), and 1/2 cup heavy cream. Then pour it over your bread. You will then want to cover the whole thing and let it sit in the refrigerator overnight. In the morning, you are gonna top it off and bake it. For starters, get your blueberry jam ready. 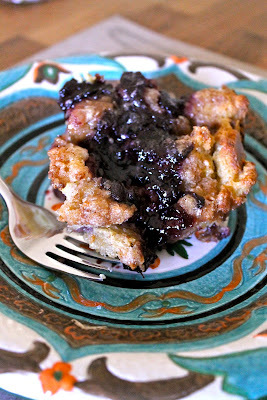 Of course you could probably use strawberry jam, but I felt blueberries really stood up in this recipe. 4-6 tablespoons really do the trick. I did two rows, laid out lengthwise so that everyone got a blueberry laden slice! Next take a stick of cold butter. You want the butter to be cold. Cut it into pieces. Toss those pieces in a bowl with a cup of brown sugar. 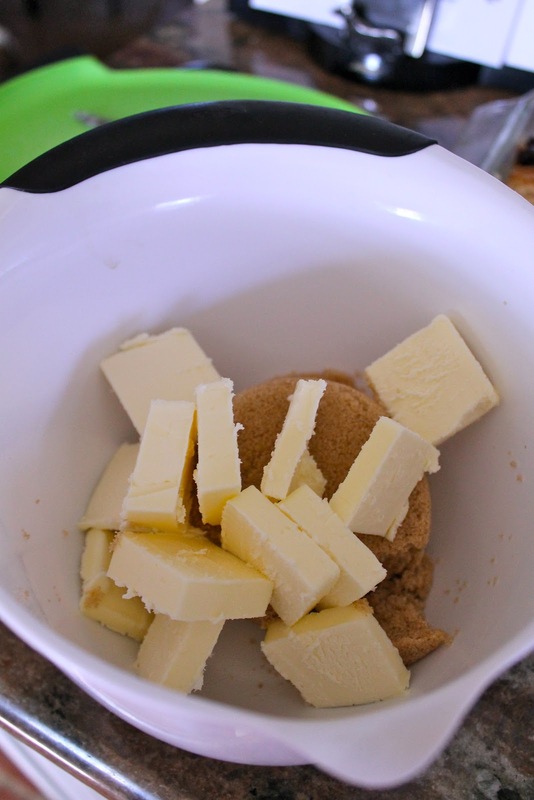 Using a pastry cutter, combine the brown sugar and cold butter so that it's basically nice little "crumblies"
Oh! And I nearly forgot, sprinkle in several dashes of cinnamon as well. I used 7 dashes because I'm crazy like that...but you can use 5. Whatever floats your cinnamon boat. 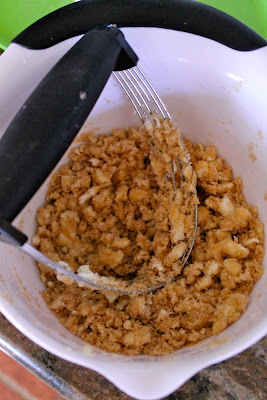 Now, take your butter-cinnamon-brown sugar crumbles and sprinkle them evenly over the whole thing. Resist the urge to pop a crumble in your mouth. Or heck, live on the edge, DO IT! IT'S MAGIC! Okay, it's baking, but it feels like MAGIC! 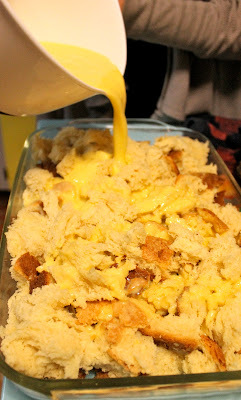 Slice, serve, consume, and realize that this french toast casserole makes everything right in the world. Time: 10 minutes prep, overnight, 40 minutes to bake | Serves 8-10 | Difficulty: Easy! 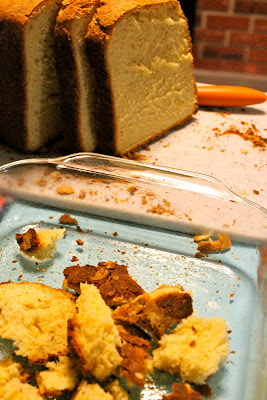 Using your hands, break up the bread into "rustic" pieces and put them in your greased pan. In a large bowl whisk together the eggs, milk and heavy cream. Pour the egg/milk mixture over the bread. Using a spatula, make sure the bread is moist all the way through, stirring a bit if necessary. Cover the casserole dish and let it sit in the refrigerator overnight. Uncover your casserole dish. Using a tablespoon, spread your blueberry jam over the casserole. I do mine in two lengthwise rows so everyone gets a bit of blueberry goodness in their piece. In a small bowl, place one cup of brown sugar. Add the cold butter, which is cut into small pieces. Add several dashes of cinnamon. Using a pastry cutter, combine the brown sugar, butter and cinnamon into little "crumbles." 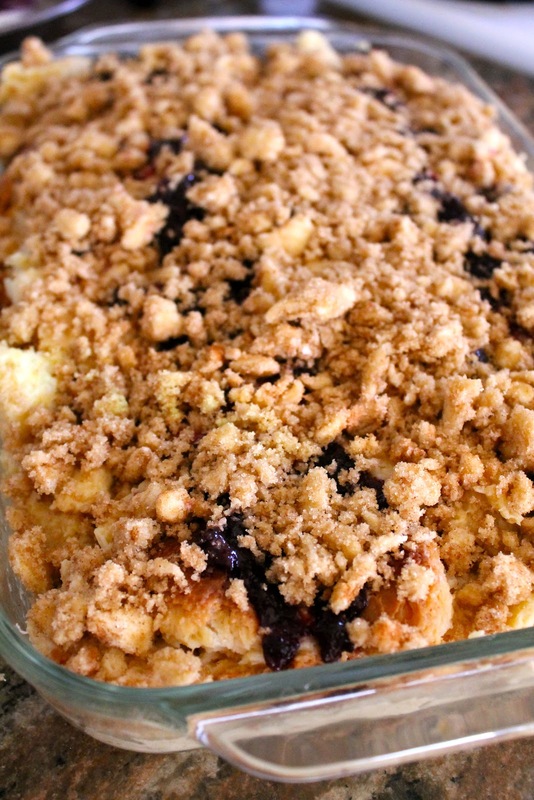 Sprinkle the crumbles over the entire casserole. Place the whole thing in the preheated oven for 35-40 minutes. If you are feeling extra frisky, serve with maple syrup!